Howdy FreeStylers. It's been a minute - how are y'all? Hope your 2012 is goin' just fine. A quickie cowhide/military look for ya today: most of the items I'm showing below are free or $1L, but you gotta hurry on a few of 'em (most def grab these gorge perfectly kelly green free shoes before they go bye-bye). I dressed down this look with a new "evil eyed" cap hair by MonS + a free fun messenger bag from the soon-to-be-ending Sesame Street Hunt (you still have a day or so to grab it); the cowprint dress is another free hunt gift, which I liked with these $1L fingerless gloves with this sleeveless look. Here's a close-up of this skin (you get the frex face tat in the paid group gift). -- Plus as you can see, apparently somebody got wind of a tres exciting Snuffaluffagus sighting. Hehe. And now I wanted to mention something that I thought would be of interest to anyone who faithfully reads this blog: a great friend to FreeStyle over the years, creator Squinternet Larnia of Donna Flora, is undergoing something truly excruciating in RL, and 1 of SL's most beloved & community-fostering bloggers, Cajsa Lilliehook, has organized a designer tribute to Squinternet that you can read more about here. 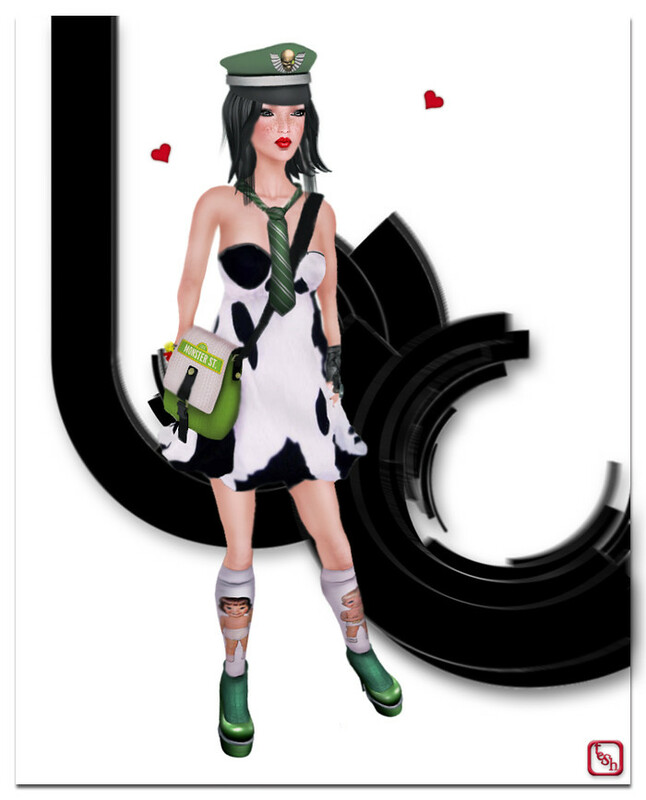 If you're new to SL, this multi-blogger effort also constitutes a visual lookbook of sorts for Squinternet's best-loved designs; there's many lovely gifties at her inworld store too, plus a lucky chair, and oodles of designs worth spending your hard-earned $L. I also wanted to salute Cajsa for organizing this truly lovely gesture (she's quite the "gem" herself!) + also because I think this kind of selfless effort should be applauded (in any life). Appreciative love + fashionista kisses to all!